Local school district administrators and Rice K-12 leaders gathered yesterday for the unveiling of the Center for College Readiness, formerly known as Teacher Professional Development. Mary McIntire, dean of the Glasscock School, and George McLendon, Howard R. Hughes provost and professor of chemistry at Rice University, spoke about the K-12 initiatives on the Rice campus. 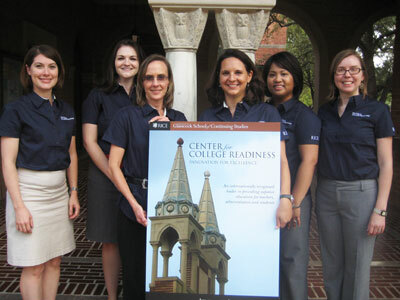 Staff of the Center for College Readiness, left to right: Lauren Evans, assistant director; Mary Hubbard, program coordinator; Amy McClurd, program director; Jennifer Gigliotti, executive director; Michelle Verduzco, program coordinator; Rachel Finch, program director. Jennifer Gigliotti, executive director of the Center, discussed the history of teacher professional development programs, its growth, the Center’s name choice and the future plans for expansion. Attendees were presented with a brochure about the new Center and enjoyed a catered lunch by Edloe Café, cake, refreshments and a take-home Center for College Readiness mug. We look forward to great things from the Center!